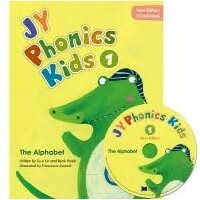 The JY Phonics Kids Series is designed for beginning English learners and is aimed to help young EFL students begin learning basic phonics successfully, step by step. The series includes 6 books each of which comes with a CD. The first three books focus on the foundation of phonics: The alphabet, the consonants and the short vowels. The following three books extend children's knowledge of word families and help young learners acquire a correct sense of language. Each book is packed with fun activities and beautiful illustrations that children will enjoy whilst improving their English ability!